Super Hero Boy: Sweaty boys in uniform. Behind Enemy Lines - Columbia is out on DVD and this was one of the movies I took to review that honestly I had no previous knowledge. I never saw the first Behind Enemy Lines though I heard mixed results as to if it was good or bad. Truthfully war movies bore me unless they carry a heavy plot which sadly I never actually expect them to, so its always a great surprise when they do. So the story sounded pretty interested and the movie showed some possible interest with its WWE production. The first half of the movie is pretty dull.. a bunch of sweaty boys preparing for a battle.. doing boy things. Needless to say I fell asleep. I did end up picking the movie back up later and started where I left off hoping things would pick up and they did, there is lots of shooting and guy humor and I'm quite positive the boys will love it as will people who live and die by war movies but it lacked the necessary plot to keep me interested. Alas the guys around here did seem to enjoy it. 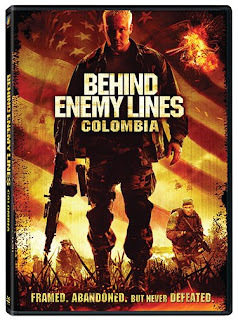 Behind Enemy Lines - Columbia is available right now on DVD and you can pick up a copy at Amazon. I have three copies of Behind Enemy Lines - Columbia to give away to my readers. They will be perfect for all the men, husbands and boyfriends out there. Leave a comment on this post. Check out Behind Enemy Lines - Columbia and tell me what is your favorite war movie. Sounds like a movie my husband would love! This is the kind of movie my husband would love. Thanks for the review. My favorite war movie is probably I Was a Male War Bride with Cary Grant. Do romantic comedies count? I also loved Braveheart, Glory, and Band of Brothers. Ha. It's like I picked the girliest of all possible war movies to be my favorites. This is the kind of movie my husband would love. Thanks! My favorite war movie is Saving Private Ryan. I would love to see this movie! My favorite war movie is saving private ryan. This looks like a great movie. Thanks! I know the guys would like this. My favorite war movie was the Hanoi Hilton. It just got to me for some reason. Thank you! My hubby would love this movie...I would too! I'm also a subscriber...thanks again! My favorite war movie is Schindler's List. Thanks for the giveaway. Enjoyed the first movie. This one looks action packed also. This looks like a good movie to watch. My favorite war move is "Pearl Harbor". My favorite War movie is Operation Petticoat with Cary Grant, another favorite is Father Goose with...Cary Grant. I LIKE BATTLEGROUND IN BLACK AND WHITE--WW2.. I can't remember the name. The one with Michael J. Fox in Vietnam. This looks a movie that DH would like. My favorite war movie is Apocalypse Now. My favorite war movie is Dr Zhivago. I guess that I would say that From Here to Eternity is my favorite war film. I am a subscriber and your button is still up on my blog. Thanks so much for this chance. I love Patton. Please enter me. Thanks. My favorite war movie is Full Metal Jacket. The Devil's Brigade, Tora Tora Tora, and Platoon. Thank you. I don't really like war movies but I lover Father Goose with Cary Grant. Full Metal Jacket will never have an equal imo. ever. My husband loves this movie...he has seen it so many times...it's a joke around the house! I would have to say that Saving private Ryan is my favorite war movie. Platoon and Enemies At the Gate are my favorites. Gettysburg combines being a good war movie along with my love of history. Saving Private Ryan is my favorite. This looks like a great action movie to watch with some friends. GOOD MORNING VIETNAM. I like the humor during the war. I don't have a favorite war movie, I mostly can't stand them. But I can't wait to see this one, because we like Mr. Kennedy. My favorite war movie is Audie Murphy's To Hell and Back. I could watch the whole Band of Brothers series over and over again. It is so well done. I think "Where Eagles Dare" is the best war movie and it is a classic. My favorite war movie is "A Bridge Too Far". Operation Petticoat is my favorite. My most recent favorite war movie is Tropic Thunder -it was a hoot :) *Thanks* for the giveaway! I asked my husband and his favorite war movie is "The Longest Day". Thanks! I would have to say the Patriot is my favorite war movie! My favorite war movie is Jarhead. favorite war themed movie "Saving Private Ryan"
Mine is an oldie...Good Morning Viet Nam! I don't really have a favortie war movie, but I can tell you what my hubby would say...it would definitely be Saving Private Ryan. We even have a copy of it in our dvd collection. Our family always liked Saving Private Ryan. I know we would like this one. Thanks! Apocalypse Now. The horror... the horror... Thank you for the chance to win. Band of Brothers would be my top fave. MASH is my favorite war movie. Independence Day, war against aliens but still a war flick, thanks for the contest. My husband loves these kinds of movies! I'd be his hero if I could win this! I think my favorite war movie is The Patriot. Hanover Street, starring Harrison Ford. Hard to find, but worth the hunt!! This is a movie that men AND women will enjoy. My favorite war movie of all time is Saving Private Ryan. Enter me in your contest please. Platoon. Thanks for the giveaway! Great movie! I'm also a subscriber, thanks! This sounds like a good movie.. thanks for the chance to win! Saving Private Ryan! Thank you so much! The Longest Day. Please accept my entry. Thank you. I'd LOVE this (I guess I'd let my husband watch too). I like Full Metal Jacket! braveheart...also my fav of all-time:) thanks! The old "All Quiet on the Western Front"
I think Saving Private Ryan depicts alot of realistic situations - and some actual footage - encountered during during WWII. Its such a good movie. I like Saving Private Ryan. My favorite war movie would be "Good Morning Vietnam". Thanks for offering this DVD in your giveaway! I subscribed via email too...thanks again! I'm a subscriber via Google reader! And my favorite war movie of all time is Oliver Stone's 'Platoon'! Thanks for the 'great' giveaway offering! Good Luck to All! Was never a huge war movie fan but I recently saw Traitor and thought it was fantastic. It's an older movie but my favorite is Hamburger Hill. Thanks for the giveaway! Looks like an awesome movie! My favorite war movie is Good Morning, Vietnam! My favorite is "Saving Private Ryan". One of my favorite war movies is Apocalypse Now. My favorite one that i can think of right now is Jarhead, but there are quite a few others that are just not coming to me right now. My favorite war movie would be Saving Private Ryan. The Patriot is my favorite war movie. I admit I am not a huge fan of war movies. However, out of the ones I've seen my favorite one is Saving Private Ryan. This is a great giveaway and I really hope I win. Thanks. Glory is my favorite war movie! Or if you want something a little more modern, Full Metal Jacket. My favorite war movie is: Good Morning Vietnam. Thank you. Top Gun is the one we like! My favorite war movie is Saving Private Ryan! Saving Private Ryan is my favorite war movie! I subscribe to your mailing list/RSS feed! Saving Private Ryan is my favorite war movie. So many great 'war' movies makes me think, this isn't just for husbands. Bridge over the River Kwai (my Fav), Patton, Bood Morning VietNam, MASH, Saving Private Ryan: All wonderful movies with war settings. Sounds like a movie I would love! I would have to say The Bridge over the River Kwai. I love Saving Private Ryan! My favorite war movie would have to be Saving Private Ryan. Maybe followed by Miracle at Santa Anna. The Patriot is my favorite! My favorite war movie if Flags of Our Fathers because it is so historic. I am a Coast Guard Auxiliarist and bugler for military honor guards, and Flags of Our Fathers really makes me think about why I am in uniform. My favorite war movie is "Saving Private Ryan". "Gone With The Wind" is another great one! Thank you for the opportunity to participate in this giveaway!